There are a few different options for Mount Sinai Hospital parking. Mount Sinai Hospital is located at 600 University Avenue Toronto. It is located between Princess Margaret Hospital and Toronto Rehab. It can be access by TTC Subway by travelling to Queen’s Park Station or the College / Carlton streetcar to University Avenue. Information below is accurate as per the Green P website as of March 2017. Parking is always challenging and expensive near city hospitals. We hope that the information below will be of some help to you during your stay, or the stay of a loved one at Mount Sinai. We, Retire-At-Home Services, provide private one-one-one care at Mount Sinai Hospital. If you would like peace of mind when you cannot be there with your loved one, or overnight care in the hospital, we can help. Our personal support workers and nurses can be at bedside with your loved one and help them with anything they need. Call us at 416-479-9659 to find out more about this hourly service. The closest Green P parking lot is a surface lot at 205 McCaul Street. It is carpark 216. The rate is $3.00 per half hour, and it has 38 spaces. It has no day rate maximum so 8 hours of parking in the day time will cost you $48.00. There are no special rates on weekends or holidays, but nighttime parking from 6pm to 7am is at a reduced one-time fee of $8.00. 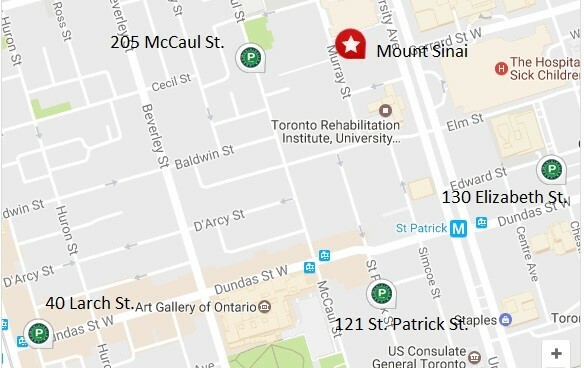 The 205 McCaul Street parking lot is 200 meters away from Mount Sinai Hospital. Next in proximity to Mount Sinai Hospital is a surface Green P Parking lot at 130 Elizabeth Street (Toronto Coach Terminal) the rate is $3.50 per half hour. It is carpark 263 and it has 27 spaces. There is no rate maximum for day or night parking, so the $3.50 per half hour rate always applies. No special weekend rates are advertised. The Green P Parking lot at 130 Elizabeth St. is 400 meters away from Mount Sinai Hospital. Also close by is a surface lot of 36 spaces at 121 St. Patrick Street. It is carpark 221 and has 36 spaces. Rates are $3.50 per half hour with no daily maximum (so 8 hours will cost you $56.00, please beware). Overnight parking is $6.00 from 6pm to 7am. No special weekend rates are advertised so the $3.50 per half hour rate still applies on Saturday and Sunday. The Green P Parking lot at 121 St. Patrick St. is 400 meters away from Mount Sinai Hospital. A great choice for cheap parking near Mount Sinai Hospital is the Green P Parking Garage at 40 Larch Street. It is carpark 150 and it has a lot of parking spaces at 357. The rate is cheaper at $1.50 per half hour. It has a comparably low daily rate maximum of $8.00 on all days of the week including weekends and holidays. The overnight maximum rate is $6.00 from 6pm to 7am. The Green P Parking garage at 40 Larch St. is 700 meters away from Mount Sinai Hospital. We did not find any free parking near Mount Sinai Hospital! There is a small dedicated parking lot just south of the 60 Murray Street entrance of Mount Sinai Hospital that is detailed here. Although very close by, each 20 minutes or less will cost you $4.50 with a daily maximum of $22.00. However, overnight, weekend, and holiday rates are great at only $6.00 for the whole day or night. Longer term parking passes are available at reduced rates for frequent visitors.